"I tried to piss all the gross stuff of the seat for you." "Bandwagon? Bandwagon? Yo, I came outta my motha wearing a Montana jersey!" Just got back from wandering the streets and taking pictures with jedimentat for a while. Now we're drinking beer and listening to the Hoboken 411 police and fire scanner. It's insane out there. Uploading photos to Flickr now. EDIT: "There's a party urinating out of the second floor window." How does that Homer Simpson quote go again? Can't think of a better time to bring out the paddy wagons. Get the tear gas, me boys! It was hilarious to see the cops hard at work dealing with the drunks while the firemen from every town in the area were also standing around in uniforms... just drinking instead. I'd have loved to see the drunk tank that night. The area from Chicago down to DC and NE from that line takes the holiday seriously. So seriously, that they're not content with a mere day - especially a mere day that might not even fall on a weekend. 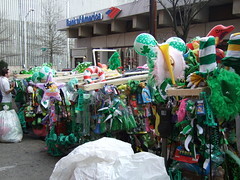 Every week leading up to the actual holiday, a few towns do a pre-St. Patrick's parade. By the time everyone takes off work for the actual drunken foolishness, they've already pre-pickled their livers for the past few weeks. It's ok, we also overly celebrate Cinco de Mayo. Yet not Oktoberfest, unfortunately. What? It's 1.3 square miles. From the tunnels to the aqueduct, it was broken glass, vomit, and urine covered sidewalks.